_ _ The absolute hardest part about trying to write on a regular basis for this blog, is coming up with something to SAY. I’m constantly trying new recipes, taking pictures of the food and making them usable for the site, but then they just sit on my desktop, mocking me: “Write something, dummy! Your two readers are waiting with baited breath!” I’ve always had trouble with the follow through, and my room is a testimony to this—stacks of unread books have been deposited next to my bed; three water glasses are currently sitting on my dresser (where I moved them from my bedside table) because I told myself that if they were a little closer to the door, I would remember to bring them down to the kitchen; and a pile of unfolded, clean clothes is in the corner, from which I continue to pick out one garment at a time as needed… But, perhaps to shut me up after all my whining about not having a job, the universe has sent me two awesome employment opportunities, so I’m trying to do the things that I’d previously been putting off before my life gets crazy, including posting some new recipes. _ _ Although I was looking forward to the Fall, Colorado has thrown me a curve ball and went straight from Indian Summer, to hail and freezing rain, but I won’t be dissuaded! I’m going to continue to make food that involves an inordinate amount of apples and pumpkin and anything peripherally related to sweater weather. 1. If making the mini version of these cannolis, take the ice cream cones and cut off the open end of the cone, about an inch and a half down using a serrated bread knife. 2. In a small, heat-safe bowl, melt the chocolate discs in the microwave for about 30 seconds at a time, stirring between intervals until nice and smooth. Spread the chocolate around the edge of the ice cream cones and then press some of the mini chocolate chips into it so they stick. Place the cones open end down on a baking sheet lined with wax paper. 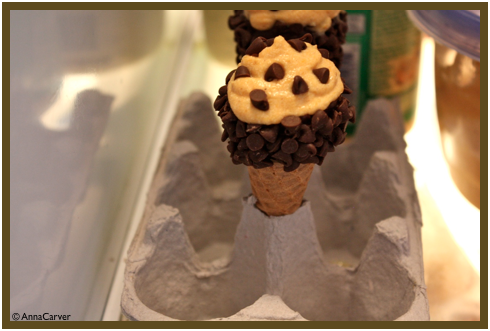 When all the cones are ready, place the tray in the fridge so that the chocolate hardens. 3. While the cones are chilling, in a medium mixing bowl beat together the pumpkin, ricotta, sugar, spices and vanilla with a hand mixer for about a minute or two, until they are thoroughly combined. In a separate bowl whip the heavy cream until stiff peaks form. Gently fold the cream into the pumpkin mixture using a spatula. 4. 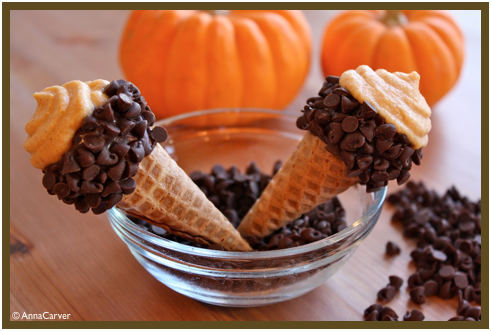 If you have an extra egg carton you can use this to create a stand for the cones (picture below) by cutting the tops off the “peaks.” Use a plastic bag with the tip cut off to pipe the pumpkin mixture into the cones and top with more chocolate chips, walnuts or whatever you’d like! Keep chilled until ready to eat. Anna as a silent blog addict, I would like to make a statement on behalf of what I’m sure are thousands (millions?) of readers who, like me, remain silent out of the pure-laziness which you described above. Your post on laziness combined with my desire to procrastinate doing anything productive prompted me to write this comment. I love your blog.